Rhododendron and Camellias are perhaps the most encountered genus of spring flowering shrubs grown in Vancouver. 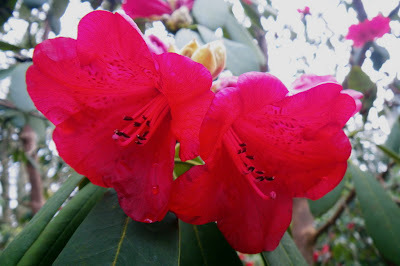 In weekend, we took a walking tour through "The Ted & Mary Greig Rhododendron Garden" in Stanley Park and we were absolutely delighted to see so many colors of the blooming bushes on the trails and to read the information about them from the nearby informative plaques. Ted and Mary Greig were renowned rhododendron hybridizers, who received the Gold Medal of The American Rhododendron Society for their Center of Rhododendron Culture built at Royston, on Vancouver Island - the source of many mature rhododendrons from the Stanley Park Rhododendron's Garden and UBC Botanical Garden. 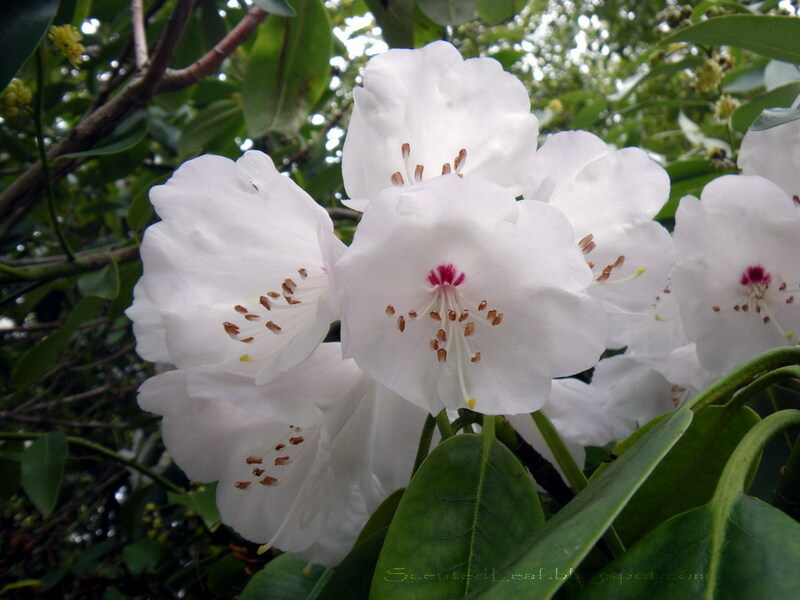 There are thousands of hybrids of Rhododendrons, Azaleas, deciduous or not, which are blooming in Vancouver's Parks since March to June with fragrant white, pink, orange, yellow or red flowers. Some species are changing their foliage in purplish or orange in the Fall, others are losing their foliage when the Winter is starting. We have just admired the mature plants which are now in bloom. 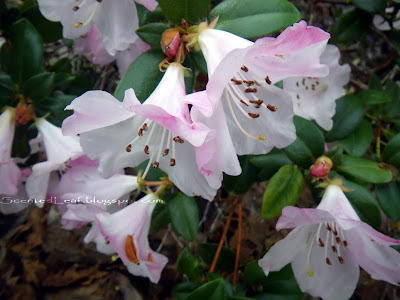 Perhaps the Robin Hood, Exbury Azalea, Elizabeth Rhododendron, Beacon and Len Living Rhodos are the hardiest hybrids because their leaves and flower buds, which have not been opening in the fall, were not affected by winter frost. 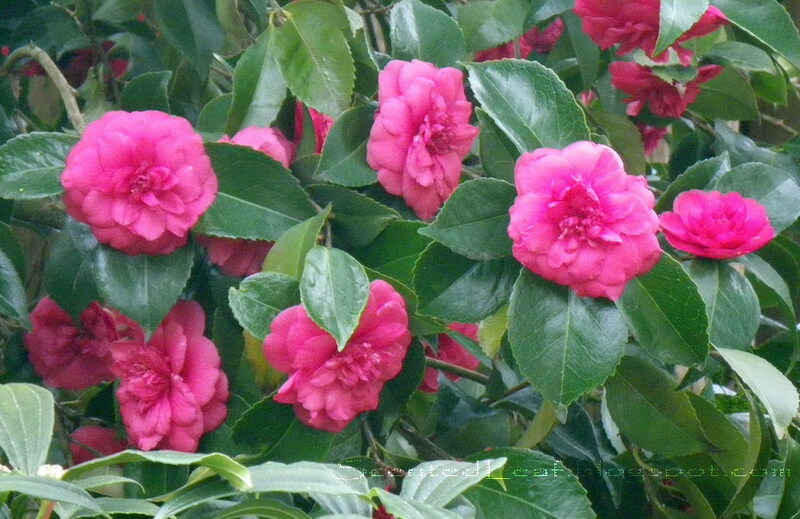 On the Stanley Park alleys the most popular Camellia is the Camellia Japonica with red or pink flowers. 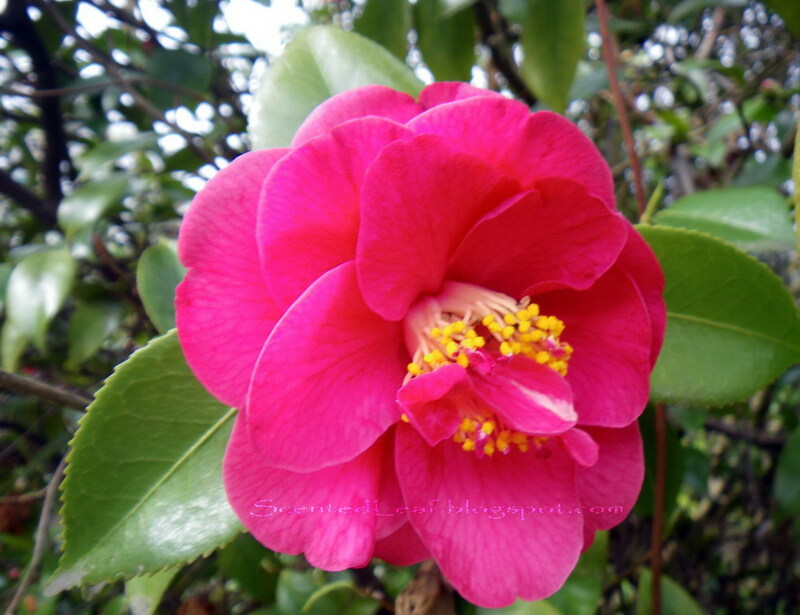 Walking along the Camelia Walk, on the west side of Pitch and Putt course, we saw some red and pink bushes of Camellia "Aunt Mavis", which would fit exceptionally well into almost any spot. The Camellia plants reach 5-6 meters in height and is really a pleasure to see and smell their absolutely stunning blooming in spring. 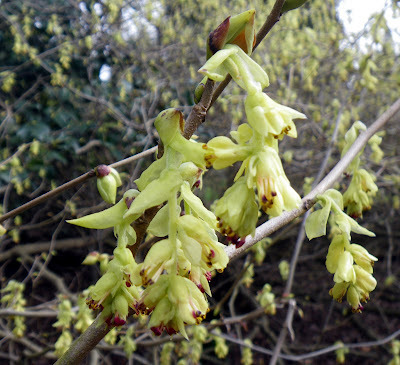 Down the path, the sense of smell was awakened by the fragrant flowers of Chinese witch hazel bushes. 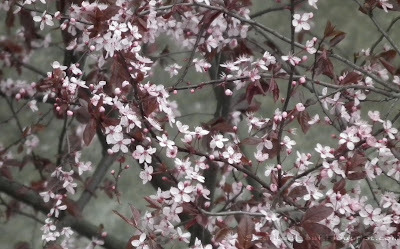 We also found some pink Cherry blossoms and Magnolia Soulangiana flower buds, although they will be in full bloom in the middle of April. It worth to walk through "The Ted & Mary Greig Rhododendron Garden" all year round, but in spring... is just marvelous to admire quietly this peaceful garden in a continuous blooming transformation. Yellow Azaleas! How beautiful. I don't think I've ever seen them in yellow before. 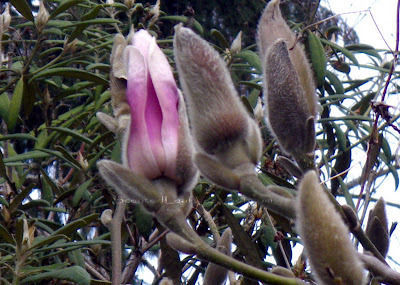 Hmmm, I wonder if they'll grow in Los Angeles. Off to do some research. Thanks for the idea. And thanks for the beautiful tour. It makes me wish Spring would hurry up and get here. You've never seen a yellow azalea before because none exist. 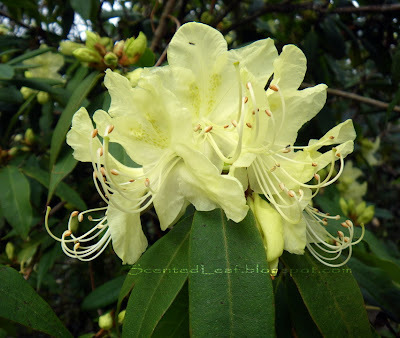 This is a photo of r. lutescens, a small-flower,small leaf rhododendron (n.b. azaleas are a subsection of the rhododendron family). Thank you for your comment; perhaps "Exbury Rhododendron Lutescens" is the right name?